Neighbors. We all have them (unless you live out in the middle of the country somewhere). While you may not get to choose who you live next to, you can create a friendly relationship that will improve your quality of life. 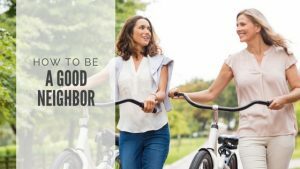 Here are a few tips you can use to become a better neighbor. Take the first step: Sometimes your new neighbors will introduce themselves and other times you may have to take the initiative to start the conversation. Meeting new people, let alone new neighbors, can be overwhelming but a simple smile and ‘Hello’ is a great way to start! Your goal is simply to learn their names and maybe even exchange contact information. Keep communicating: Communicating with your neighbors is the key to building and maintaining a positive relationship with your neighbors. Whether you’re hosting a party, renovating your home, or anything else that may affect your neighbors, try to minimize the impact on them and let them know in advance. Keep the noise down: You’re not expected to be completely silent but it’s wise to respect the basic rules of noise levels. Don’t start yard and home maintenance projects too early in the morning, don’t unnecessarily rev your car or motorcycle engine, and try to keep children or pets quiet in the early mornings or late at night. A little warning goes a long way: If you’re planning a party at your home, give your neighbors a friendly warning about when it will start and how long it’ll last. And if your party drags late into the evening, be considerate and move the music and conversations inside and ask your guests to keep the noise down as well as they leave. If you’re having a large party, why not invite your neighbors as well? Maintain your curb appeal: No one wants to live next to the house with overgrown yard or trash cans that sit out all week. Take care to maintain the exterior of your home: mow the lawn and tend your garden, make sure trees and shrubs don’t creep into your neighbor’s yard, take your garbage cans out on the correct day and bring them back in promptly. Keeping your home clean and upkept will help maintain property values in your neighborhood. Notice what’s happening: You don’t need an active or organized ‘Neighborhood Watch’ to keep an eye out on the happenings in your area. Keep an eye out for anything that is out of place and let your neighbors know. Also take some time to be a helpful hand; if you notice a neighbor has been too busy or is unable to maintain their yard, offer to help. A little thoughtfulness goes a long way. Be pet-friendly: Your pets may serve as a great way to meet the neighbors, but be a responsible (and respectful) pet owner by being mindful of your four-legged family member. Always pick up after your pet (even in your own backyard!) if they relieve themselves in a neighbor’s yard, don’t let them run around the neighborhood unattended (cats included!) and try to mindful of your dog’s barking, especially during the overnight hours. These tips are a great place to begin establishing a relationship with your neighbors. When everyone tries to be good neighbors, we all feel like we’re surrounded by friends and enjoy where we live.